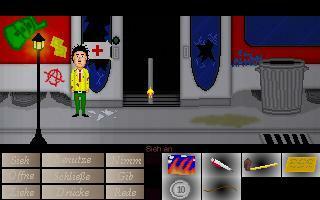 After a black-out our hero awakes in a train which is used as a hospital now. Dr. Einzig tells him that many people have died over the last weeks - strange things are happening 60 years after the storm... (only in german yet!) Important: You should better play Feuersturm - Chapter 1 first! "A new player character helps us to understand the story better. This part is a bit longer than the first chapter, with better puzzles and better immersion. Note: The game is only available in German and requires to have played part 1!" Ah, that was you. ;) I have already read your comment about the red text in the entry of chapter 1 – sorry that I did not change it, but I thought that could dazzle somebody – especially because of the new (second) character in chapter 2. Thanks for your statement. Nice little game; good fun. I didn't like the red text though, sometimes very hard to read. Thanks, and thanks for the password hint!